Enter an enchanted world where dashing princes rescue beautiful princesses, where wicked stepmothers do battle with good fairies, and where romance, danger and excitement captivate the reader. 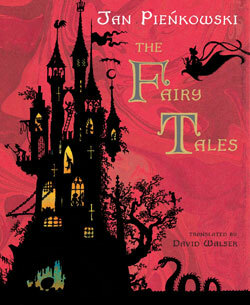 This glorious collection of four of the most beloved of European fairytales will weave its spell on you. Faithfully translated from the original French and German, each tale remains true. "Every page of the four fairytales is adorned with a miracle of fantastic grace and wit." "Ravishingly beautiful, this is a book that will stay in children's memories for life." "Jan Pieńkowski's stylish silhouettes create marvellously mysterious and romantic forest backgronds for this collection of freshly retold stories." "Pieńkowski's pictures bristle and swarm with authentic fairytale menace, comedy and beauty: if you have a child between 4 and 7, don't miss it."